Although International Women’s Day has passed, women never stop being women and doing amazing things. To keep up with the happenings in the world of women, we continue with our incredible women profiling. It’s time to take a closer look to behind the seams of preloved and many other renowned clothing brands. 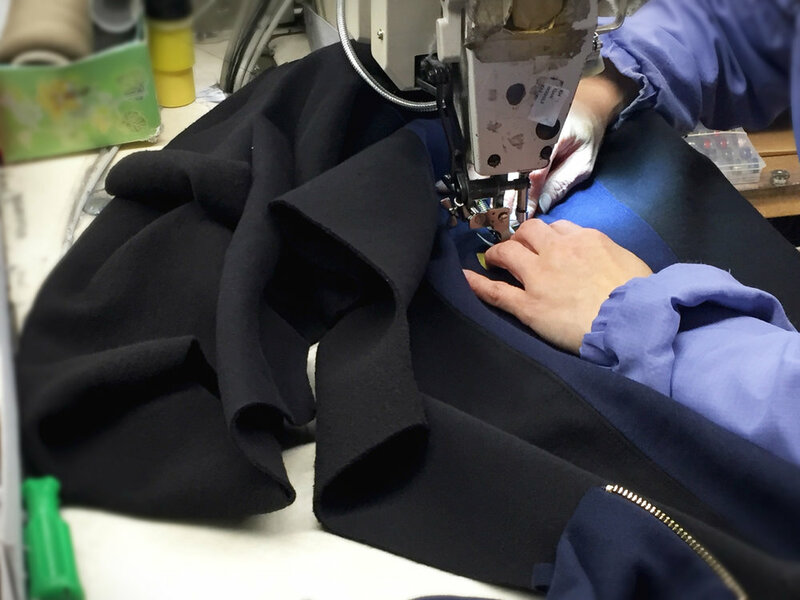 Closer, and closer, to the very hands that make our fabulous garments, a wonderful hardworking women packer and seamstress right here at WS & Co.
WS & Co. is a 100% Canadian owned and operated apparel manufacturer. They are a rare sight; as they are one of the few Canadian clothing manufacturers that offers a full set of services. 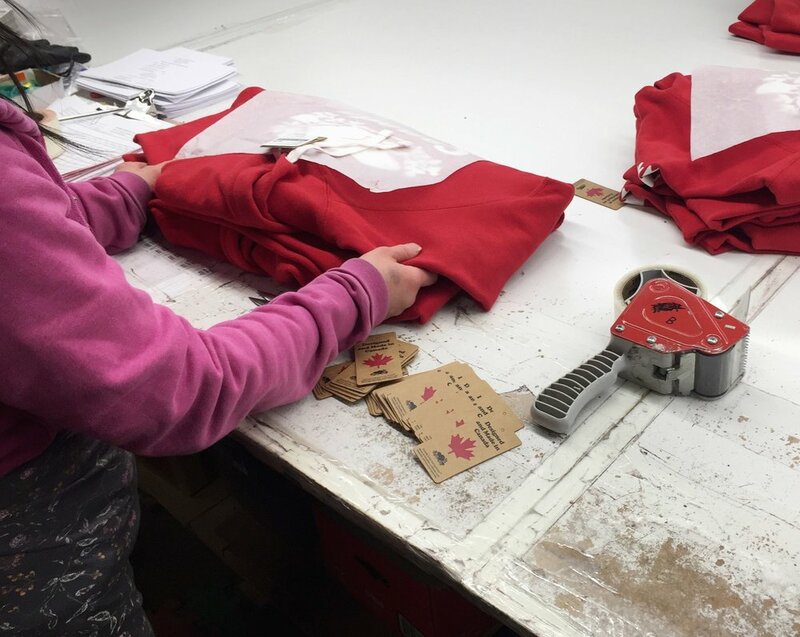 They do everything involved in the production process from cutting, sewing, dying, washing, screen printing, to shipping, and more! They assemble garments using a combination of trusted traditional practices and modern technology. Over the years, the hard work and rarity of their kind of business has caught the eyes of big-name brands like Billy Reid, Gap, Holt Renfrew, Hudson’s Bay, Todd Snyder, Roots Canada, and—that’s right—preloved! Our office is in fact right here in their building. What else makes WS & Co. so special? They sell quality and they support the local economy by producing right here in Toronto. They are proud to add “Made in Canada” to each one of their labels. Not only is it the truth, but it’s also a stamp of pride and quality. One of the main things about WS & Co. is that they care for their staff like family. They had the choice to save money by outsourcing, but WS & Co. chose to ensure their workers safety and well-being by providing an environment that follows the rules and regulations of the Canadian government. I found a job opening in the newspaper and I applied for it. What are your day-to-day activities like? Folding, sorting, and packing clothes into boxes. I sometimes do steaming to make the clothes flat. I have been doing it for over ten years, so I am an expert at it! What do you enjoy doing here? I like everything about the job. I enjoy organizing and sorting things. Who are some important women in your life and how do they inspire you? They could be family, people you know, celebrities, etc. My mother. She worked really hard. She worked in a restaurant. Her hard work has always inspired me. I like listening to music and shopping. Did you know much about fabrics or clothing before you worked here? I knew a little bit, but after working here for so long, I have learned a lot more. I learned from others in the factory and I have taught myself things too. One of my friends introduced the job to me. I sew fabrics into garments. I operate sewing machines, add buttons and zippers to clothing, and put many different fabric pieces together. I enjoy what I do, I enjoy everything here. I love piecing different things together in order to make things. My mom! She does a great job at home by taking care of the house. I love enjoying the wonderful internet! There are so many things to do on there. You can keep in touch with people and things from around the world. Over eight years I have worked here.